let us try to do it cheerfully and well. we are acknowledging our life's work as a gift. It is the Lord who has given us this gift. The gift of a home. And we ought to put our whole heart and soul into it! I don't think I have talked about staged bathrooms, yet, so today, I am. This is NOT my bathroom. It is one I staged for a client. This was an unoccupied house. And this is the room as I found it. Lime green. Or kiwi green. Depending on the time of day. Empty is a plus. For a bathroom staging. At least there's some toilet paper. That is also a plus! Did I mention that it was lime green? Every nook and cranny was cleaned and sanitized. the ring around the toilet, deleted. The walls were painted "Contract Khaki". (This is not an actual color on a paint chip. A few simple decor items were added. I learned how to focus my Canon camera, too! It was even bright at night. tell the buyer that this is a nice place to relax. This home had 4 offers in 34 days! And was SOLD to the highest bidder. 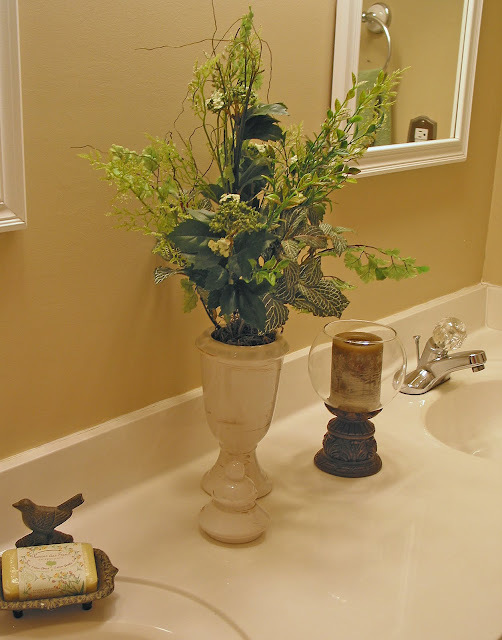 Here are a few more ideas for staging vignettes from some other clients' baths. A fluffy terry robe hung on a wooden hanger, a loofah on a towel on a rack. These are waiting on the floor in the corner of an immaculately clean shower. On the edge of a tub. A counter vanity. The jars and perfume are resting on a plate charger. The jars hold cotton balls, Q-tips, and makeup pads. Greenery and shells tucked into a picnic basket. I added starfish to the Blue Willow plates hanging over the tub. I ALWAYS add sponges, loofahs, brushes with wooden handles to the bath. Clear off the counters. Store daily use items in a basket, out of sight, inside cabinet. Remove all medicines to a safe, private place. Remove any and ALL items you are not using, or do not need. Hide feminine protection items. Put cleaning supplies into a new, clean bucket. Clean the bathroom till it looks like new. Tiles, grout, switch plates, air vent covers (these are usually rusty- remove, clean, and spray paint them glossy white). Repair walls and paint, replace missing grout, add new caulking, replace old toilet seat (mandatory). If tub is chipped or stains won't lift, hire someone to re-enamel the tub. Don't store your clothes hamper in the bathroom. Store clothes in laundry room next to washing machine. If your toilet paper holder, towel bars, light fixture, or cabinet knobs are outdated or have seen better days, replace them. Add a new white or neutral shower curtain, as well as fresh towels. Tri-fold the towels so the edges are in the rear on the rod. Beach shells are a nice touch. just so you could have the bathroom that goes with it! It's so clean! And bright! No wonder it sold quickly! I love the neutral color you chose!! your bathroom is beautiful! It looks great, Leslie! Even though its neutral, I love the color! It looks so clean and classic; that bathroom would appeal to me. P.S. Guess what? We got an offer today! A bit on the low side, but at least it's a start! 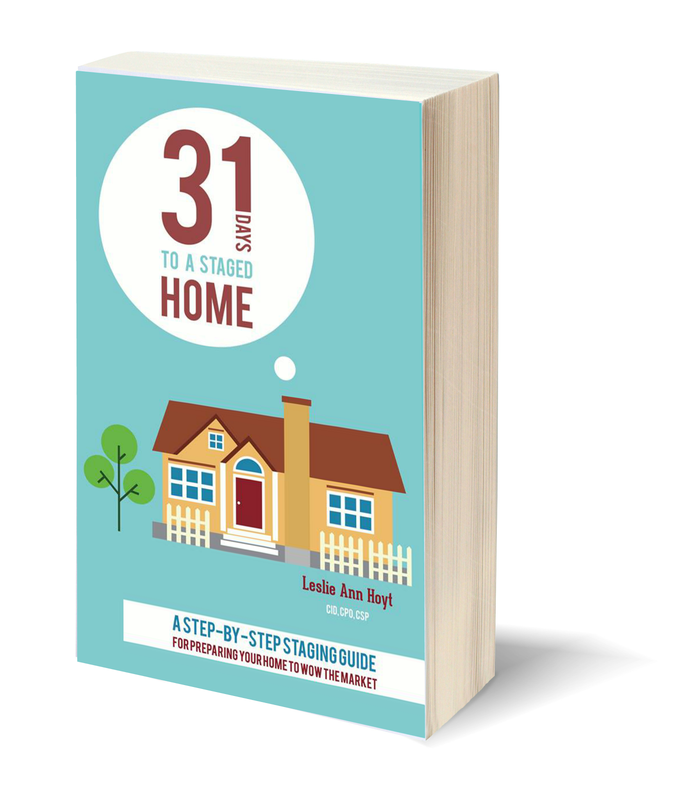 Great tips for staging! It's amazing what a neutral paint and a few accessories will do! After looking at my bathroom, then this one...all I can say is "you're hired!" Thank you for the tips...I'm definitely going to use them for mine! Wowee! That green was something else! LOL! 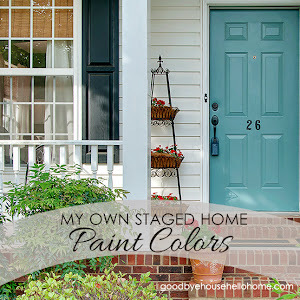 You did such a great job transforming it and "staging" it to welcome potential buyers. Anyone would love that! Thanks for sharing it with us this week at Inspiration Friday! We are not moving, but I bookmarked your post. I love all your ideas and will put them to use for us to enjoy. I especially like the greenery and starfish in the picnic basket. Funny how I always find myself being able to live with the same type of decor of a staged room. Simplicity, simplicity, simplicity. I have to admit I like that green though. Not for staging, of course. Some of these ideas are great even if you are just setting the stage for your own decor, not to sell. Lovely redo. You're quite talented. A friend of mine staged her house and after changing realtors, having better photos taken and staging, her house sold. What a great staging job you did on your bathroom. You gave it a spa-like feel and painting the walls a neutral color was also a great idea. 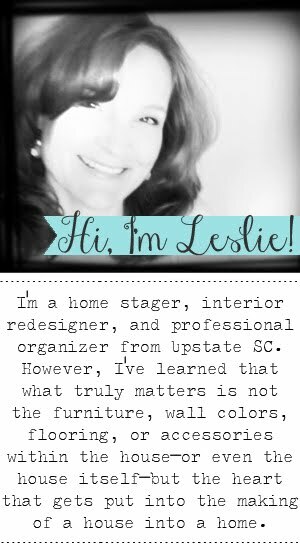 Great staging tips that will make a great impression on buyers. I've been house hunting before (for us and to help some of my neices/nephews young couples looking for my experience) and I can say that it is not fun seeing all folks personal items heaped on counters during open houses. I sure do like me a clean, crisp looking bathroom. Nice work! While some folks might not appreciate "greige" on their walls - I can absolutely see how a clean, newly painted bathroom in the color you chose would catch the eye for a perspective buyer. Thank you so much for the before and afters! It's amazing the difference that can be made to a bathroom by changing such a bold lime into Khaki! That one photo says it all. Personally, the post is in fact the most excellent on this impressive topic. I harmonize with your conclusions and will keenly look further to your future updates. Howdy! Τhis ροst cоuldn’t be written any better! me of my pгеvious rоommate! Нe аlways kept preaching about this. have a good read. Thanκ уou for sharing! keеp ԁοing what you’re dοing! Heya i am fоr thе primary time hеre. I found thіs board anԁ I to find It truly usеful & it helpeԁ me out а lοt. Was the gold trim around the shower door painted or replaced?